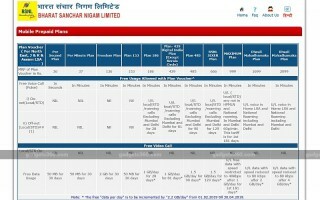 Bharat Sanchar Nigam Limited (BSNL) has extended the legitimacy of its popular 'Bumper Offer' once again. BSNL Bumper Offer will now be available till April 30, 2019 and users will now get 2.2 GB of data instead of additional 2.1. Recall that, BSNL launched 'Bumper Offer' in September last year. After the launch of the offer, additional data was given at 2.2 GB. But later only additional users were given extra 2.1 GB data. This offer of BSNL is valid for Recharge plan of Rs 186 to Rs 2,099. Recall that, in November last year, BSNL had added two schemes of Rs 1,699 and Rs 2,099 to 'Bumper Offer'. On the official website of BSNL, the validity of the bumpers offer has been confirmed. Recall that, Bumper Offer was valid until January 31 first. The BSNL bumpers offer benefits of Rs 186, Rs 429, Rs 485, Rs 666, Rs 999, Rs 1,699 and Rs 2,099. Once again, in the offer, BSNL users are given a maximum of 3.2 GB data, Rs 429 and 1 999, with a plan of Rs 186, and one GB data per day. Rs 485 and Rs 666, Plan 3.7 GB data per day, plan 4.2 GB with a plan of Rs 1,699 and lastly Rs 2,099 for the company's talk. With a plan of Rs 2,099, you get 6.2 GB data per day. It is noteworthy that there has been no change in the validity of the BSNL Recharge plan. Plan for Rs 186, plan for 28 days, Rs 429, 81 days, 485 rupees come with validity of 90 days. The plan for BSNL's Rs 1,699 and Rs 2,099 is coming with validity of 365 days. The plan for Rs 999 will be available with the validity of 181 days. Explain that, the website Telecom Talk first spotted this news. Except Kerala, this plan of BSNL is available in all circles.